Stepping into Karen Radley’s townhouse maisonette is more like entering from a rue in Paris’ Saint-Germain district than a quiet road in north London. And once in the living room you are dazzled by a scene of French elegance reminiscent of a baroque salon. What the property lacks in size it certainly makes up for in splendour. Chandeliers sparkle, gilt frames glimmer, and sumptuous velvets twinkle from the upholstered seats of antique furniture. Filled with exquisite antiques, luxurious surfaces and vibrant hues, Karen’s home is like a jewellery box of glistening treasures. 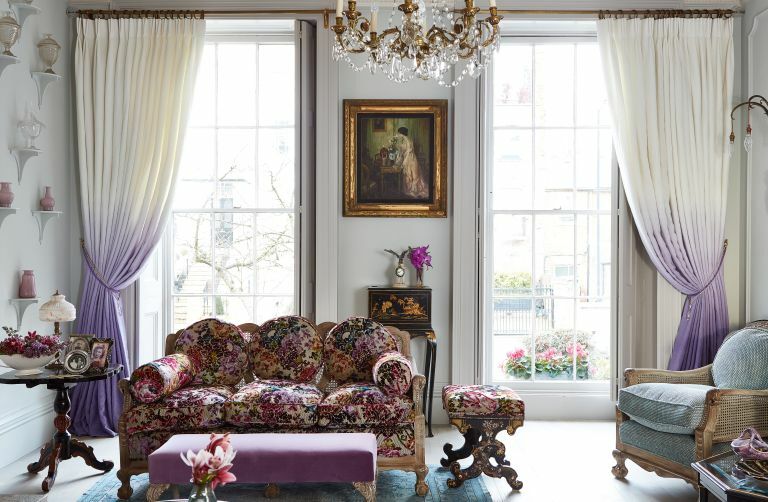 ‘I’d describe it as vintage boho meets 19th-century Paris,’ she says. Yet this scene of opulence is a far cry from how it was when Karen moved in. Built in 1818, the townhouse had been divided into three dwellings in the 1960s, and when Karen bought the maisonette in 1989 some horrors from its reconfiguration still remained. ‘It had lowered false ceilings with huge eyeball spotlights, wall-to-wall anaglypta paper, and most of the period features had been removed.’ says Karen. Find out how she transformed the space, then check out more real home transformations. Check out our guide to renovating a house, too. Undeterred by the dated décor, Karen knew the property had the potential to become her perfect home and was won over by its handsome proportions, large sash windows and romantic history. Karen says bringing her unique style to the space has been a real labour of love. After moving in she quickly got to work stripping the rooms and reinstating lost period features. She was keen to make it as faithful as possible to the era, so did plenty of research and enlisted the help of specialist tradespeople. To return the home to its former grandeur, cornicing was installed by plasterer Tony Byrne and traditional fireplaces were fitted by Browns of London. Karen loves chandeliers, so didn't waste much time replacing the 1960s spotlights with antique fittings. With a family heritage in the textile industry and a career in the fashion industry that takes her across the globe, Karen has been immersed in textiles and travel from an early age, and these passions are clearly reflected in her home. Dotted throughout are sumptuous textures from velvets and embroideries to kilims and toiles, and unique pieces from Paris to the Middle East. Bespoke storage, smart use of furniture, mirrored surfaces and a light palette are all devices used here to maximise the feeling of space, while co-ordinating fabrics and colours bind spaces together. ‘It’s been a long journey, but it’s now complete,’ says Karen. ‘I was fortunate enough to have an excellent team, especially the decorators Christie & Co, who really pulled all the work together.’ Although she’s over the moon with her home, Karen admits she’s itching for a new challenge – ‘perhaps somewhere with a garden.’ No doubt it will be a vision of elegance and sophistication.